What is the most comfortable harness for small dogs? 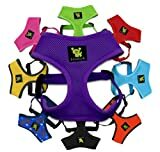 Best choke free small dog harness? 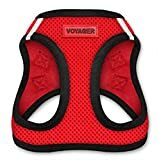 Best nylon harness for small dogs? 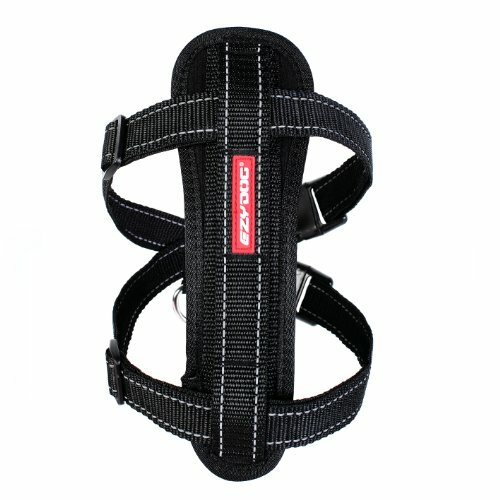 Best no-pull small dog harness? 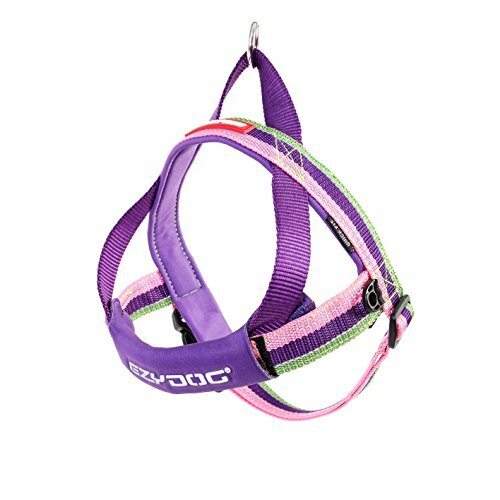 Best adventure harness for small dogs? All dogs; big and small, love to get outside for a walk every day and to get a chance to explore the surroundings in the company of their best friend (you). To do this safely it is important to invest in the best small dog harness you can find, because just like with any hobby activity – quality gear is essential. Your fur baby needs a small dog harness and retractable dog leash that is reliable, easy to use and comfortable to wear so that you can get the most out of your outdoor time together. You might be interested in: Top Rated Dog Raincoats. Choosing the best harness for small dogs is fun but also challenging, as you need to consider how you plan to use it, what type of dog you have and what would work best for the two of you. Here below are 15 small dog harnesses that fit the bill of what a quality product needs to be. We think you’ll like: Best Dog Foods for Small Dog Breeds. 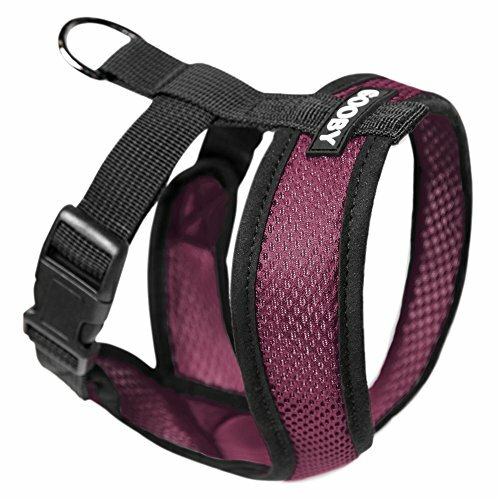 Harness is sturdy and robust, and a good reminder of smaller dogs also deserving quality gear! 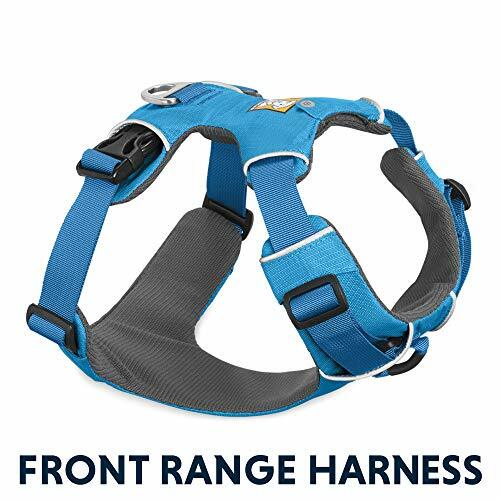 This Front Range All-Day Adventure Harness is suitable for all types of dog breeds, and to accommodate extra small dog harness users – you are given the convenient size options of XXS, XS and S. Small dogs can be pullers too, and this comfortable and soft harness for dogs that tend to get a little overenthusiastic is an excellent solution. The RUFFWEAR Front Range All-Day Adventure Harness features a two dog leash attachment points; one in the front to reduce pulling, and a regular attachment point on the back. Harness for dogs is easy to put on thanks to the buckles on the sides and the padding allows for it to be worn all day without causing discomfort. Plus-points for the extra small dog harness size. As an adventurer, we think your dog would love these dog water bottles! Dog harnesses for small dogs need to be comfortable, and this harness for dogs has just the right padding and design to fit securely without causing rashes or irritation. The manufacturing company is owned by a US Navy veteran, which shows in the clever and functional construction of the comfort dog harness, and you will be getting a high-quality harness small dogs will love to wear. The anti-scratch oxford material adds to its durability, it adjusts with straps and there are multiple color options to choose from. Why We Liked It – This dog harness for small dogs offers a perfect fit and just the right pressure around the dogs’ body, which could have calming effects on a nervous or jumpy pup. Looking for an extra small dog harness or perhaps XXS dog harnesses? Then hold it – this might be the product for you. This adorable yet sporty harness for small dogs comes in the sizes you need, while also providing comfort, durability, multiple color options, and user-friendliness. This soft small dog harness is kept in place with buckles and adjustable straps, and the straps have discrete reflective stripes running along their outer edges for increased visibility at night. Always be careful when walking your pup in trafficked areas at night, however, to avoid accidents. Also, protect their paws with dog socks and boots. 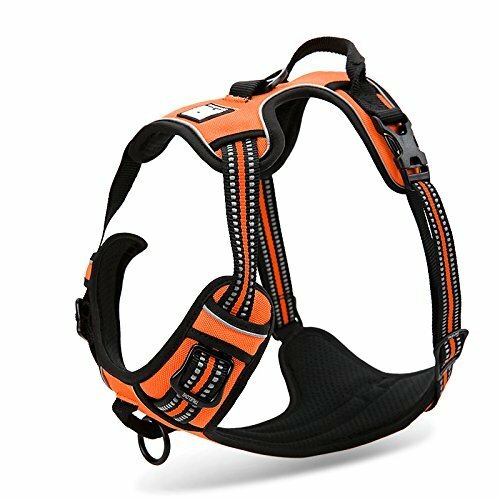 You can get this small reflective pet harness vest in neon orange, neon yellow, pink, green, blue, purple and many other colors, which gives you a chance to pick one that fits your personality and that of your dog. Why We Liked It – An all-around reflective pet harness such as this is hard not to like! It is great for regular walks, for car trips since it can be used as a safe car harness for dogs that you can attach a seatbelt too, and it is lightweight enough to keep a small dog comfortable even during long hours of use. PLUS you can attach it to seat belts on car journeys! 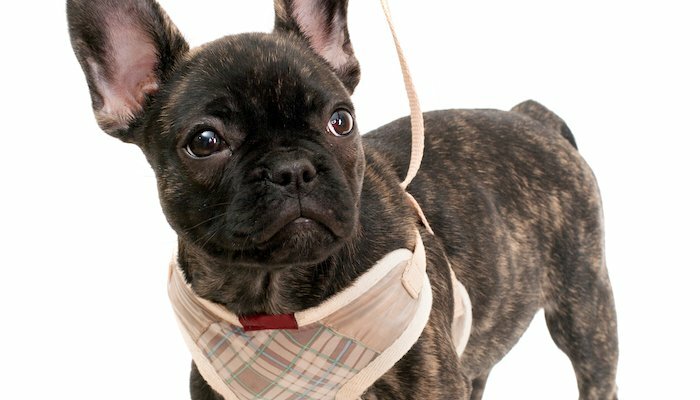 Small dog harness vests are smart options for a tiny pup, as they are extremely lightweight and barely noticeable when worn. This Original Ecobark X small dog harness is eco-friendly, with adjustable straps made from recycled water bottles and made with lightweight and non-toxic polyester. The flexible air mesh of this step-in harness is breathable and allows your dog to move freely while dog walking, running and playing, and the Velcro closing is incredibly easy to use when putting the Original Ecobark adjustable dog harness on and taking the step-in harness off. Do something great for the environment as well as for your dog by purchasing these environment-friendly harnesses for small dogs, and head out in nature with your pup with a great looking mesh dog harness and a clean conscience! Why We Liked It – As humans, we need to start thinking about the environment, and especially if we want to be able to continue to walk our dogs in nature and in the woods. This Original EcoBark Control Mesh Dog Harness uses eco-friendly materials, such as recycled plastic bottles, to make a comfortable and functional step-in harness for small dogs. Harness wraps itself around your dogs’ body so that he or she feels comfortable, while also being completely secure. Harness makes a great Yorkie harness or an adjustable dog harness for similarly sized dog breeds, and the company is so sure of their product that they offer a lifetime guarantee. Why We Liked It – Having a dog that escapes his or her pet harness is stressful, and it is great to see an adjusted harness which combats this issue while still being comfortable and stylish looking. This right here is a dog harness for small dog pals, and it can easily be put on the dog without having to pull it over his or her head (something some paw friends find unpleasant). 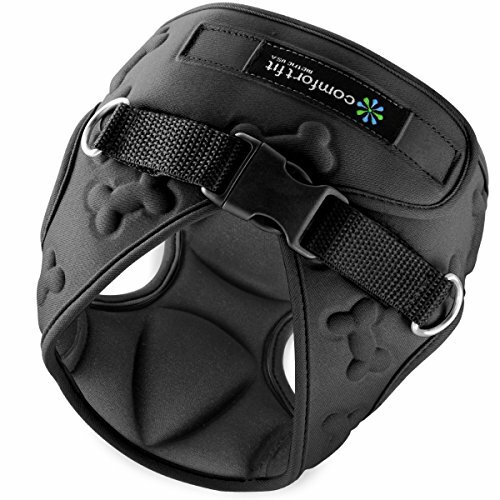 Right on the neckline is a quick-snap buckle that opens up, allowing for you to simply wrap the front-clip harness around the dogs’ neck like you would a fancy dog collar, snap it closed and adjust the straps. 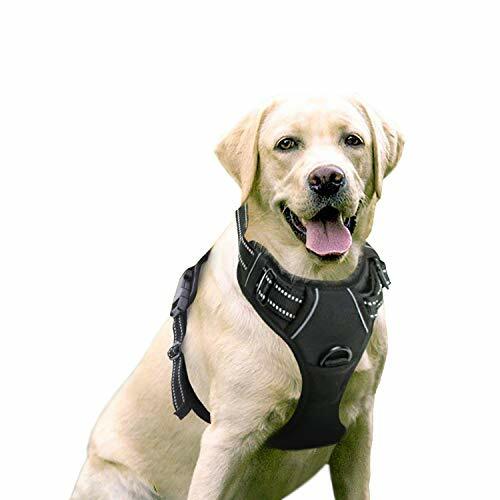 This front-clip harness has a front clip for anti-pull effect, and it is designed ergonomically to make sure it will not choke your dog even if you have a puller on your hands. Sizes range from XS dog harnesses and all the way up to XL. Why We Liked It – Not only are these small dog harnesses soft and ergonomic, but they also look great and come with a no-pull front clip. Great value for the money. If you plan to go for adventures with your fur buddy, then these pet harnesses for small dogs are walking harnesses to keep an eye on. 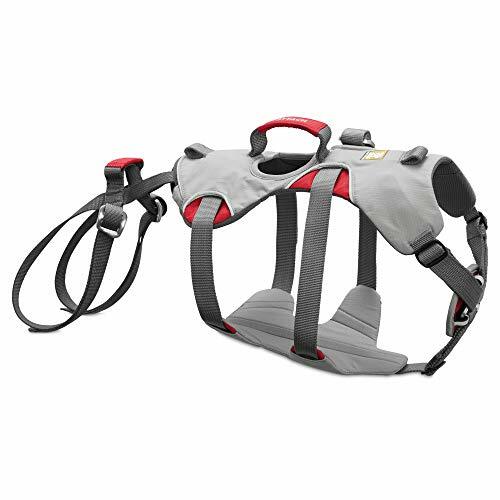 The handle on the back; in contrast to other dog walking harnesses, is made for safe lifting, which makes the harnesses perfect for hiking in difficult terrain. The support is there, to make sure your dog is comfortable even if needing to be lifted over obstacles, and he or she will also look like the coolest pup on the trail! Why We Liked It – This is a great adjustable dog harness for anyone who wants to go on adventures with their pooches, but it could also be the ultimate little dog harness for an older pet or one that is injured, since the handle would allow you to safely help them up on things and over obstacles. Using this comfort harness for small dogs is no more difficult than using a shock collar, and it is easy to fit thanks to the no-adjust design! Just measure your pooch properly before purchasing or ordering, and you’ll find that the custom fit harness fits like a glove. The padded chest girth sleeve is made with waterproof neoprene, and it has an ID ring attachment to make sure your dog can be identified if he or she would ever get lost. These custom-fit soft harnesses for small dogs are comfortable, cute, very lightweight and easy to put on and take off, and it will make walks and adventures a lot more fun for both you and your beloved pup. Why We Liked It – When looking for a no-hassle harness, this custom-fit adjustable dog harness is the one to consider. It fits perfectly as long as you purchase the right size, and it won’t weigh a small dog down. Some believe that only big dogs need anti-pull harnesses, but the truth is that a small dog also needs to learn to walk properly on a dog leash. This soft dog harness for small dogs divides the pressure evenly across the dogs’ body, which significantly lessens the risk of injury due to jerks or pulling dog tendencies. There is no need to put it over the dog’s head as it can just be clipped together with the quick-release buckles and taken off just as easily. This no-pull dog harness comes in fancy black that goes with any color of coat, so just make sure you measure your fur baby properly before purchasing. Why We Liked It – This RABBITGOO no-pull dog harness is simple in its construction, easy to put on and take off, it weighs very little which makes perfect walking harnesses for tiny dogs. The RABBITGOO anti pulling dog harness also looks tough and adventure-ready! The memory foam used to make this small puppy harness is great in a way that it forms around the dog’s body and stays that way, to give the pet harness a perfect fit. It is lined with comfy fleece and has high-quality plastic rings to hold it together, and it will be a great fit both for tiny dogs and for those a bit bigger. They are dog harnesses small dogs will feel comfortable in, and they’re designed so that your dog can step into it and then have it secured across their backs. This type of easy walk harness is both comfortable and easy to use so that you can get out the door in no time with your furry family member! Why We Liked It – Small puppy harnesses and tiny dog harnesses need to fit perfectly, and this unique usage of memory foam ensures that it fits as if it was tailored to walk your dog nicely. If you tend to take your dog out on a lot of car outings and adventures, it is a great idea to get an extra small puppy harness (or whatever size your pooch requires) that can be used both for walking and as a car safety harness! 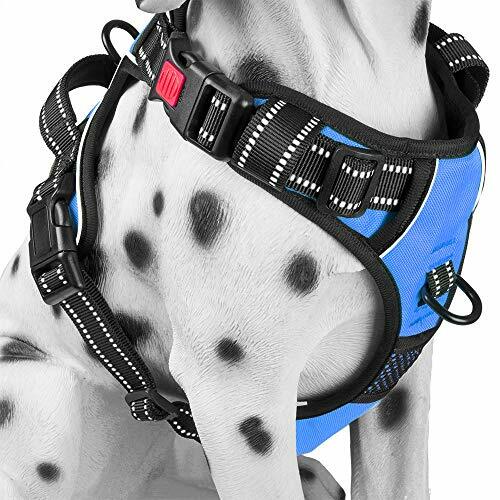 This harness for dogs with reflective stitching is designed so that pressure will distribute evenly in case you have to hit the breaks unexpectedly, for example, which prevents your dog from getting hurt. This chest plate harness for small dogs is also comfortable and allows for non-restricted movements during walks and playtime, so that you can use the same easy walk harness for your whole day out, rather than to have to have several different ones. Why We Liked It – Regular walking harnesses aren’t always apt to be used in the car, so for those who don’t wish to carry an extra harness with them on outings – this is the way to go. Comfortable and ergonomic, as well as easy to put on and take off. 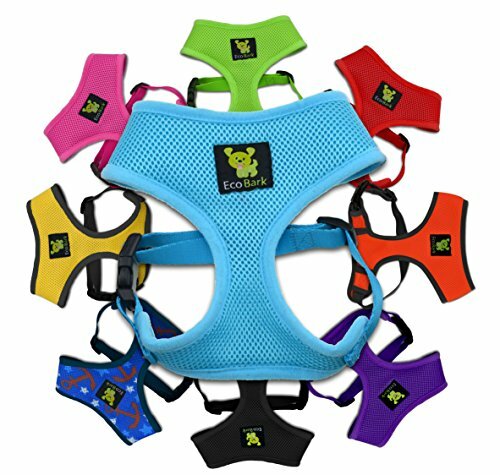 This tiny dog harness is simple, comfortable and colorful, and it will make any small dog happy due to being lightweight and breathable! It is also machine washable, which is great for those who have pups that enjoy a good roll in the mud during a hike or a visit to the dog park! Just pop it in the wash and it will be as good as new in no time. The V-neck shape prevents the dog from choking when a pulling dog moves forward, and it is a dog harness small breed dogs will thank you for (or they would if they could). The microsuede trimming minimizes abrasion, and it can be used all day without causing rashes or discomfort. Why We Liked It – While this product does not come as an ex-small dog harness, it is worth measuring your dog to see if a Small would fit. 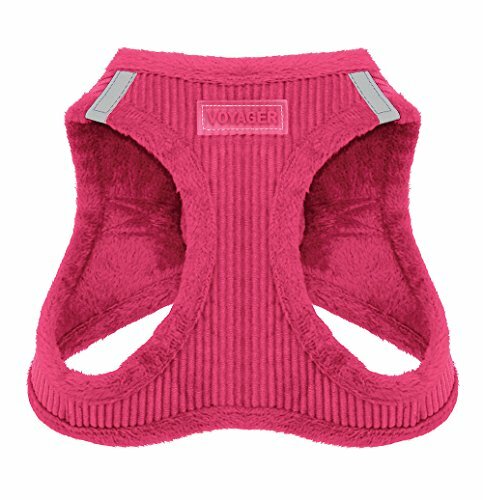 It is comfortable and soft, perfect for playing and running around, and it does not irritate your dog’s sensitive skin. Check out the Gooby Choke Free Freedom Harness as an alternative. This toy dog harness is so soft that you are going to want one for yourself! This dog harness comes in pink, red, brown, black and beige, and you can get both an xs dog harness or something a little bigger if your pup requires it. The fabric used to make this product is fussy and warm – perfect for chilly mornings and colder days, and it can even be used indoors if it gets a little cold during the winter. The Voyager Soft Small Harness has a simple step-in design and fastens with heavy duty Velcro and is secured with a quick-release buckle on the back, and it can be washed in the washing machine if it would end up getting dirty during a walk. It is recommended that you let it air dry by laying it out flat. Why We Liked It – These make great puppy harnesses for small dogs, since they are extremely comfortable and soft, which will make a puppy feel both safe and warm on colder days. Puppia is known for their comfortable small dog harness soft options, and they have many years of experience creating pet supplies with your best fur friend’s well-being in mind. This Puppia Soft Authentic RiteFit Harness for toy dogs has an adjustable neck and an adjustable waist strap, to make sure the soft mesh dog harness fits perfectly both for comfort and safety. The Puppia soft dog harnesses come in a large variety of colors, just like we are used to seeing from this brand and finding the right one for you won’t be very hard at all. Soft mesh dog harness material allows for your pup’s skin to breathe, making sure that there won’t be any rashes or discomfort caused by using the RiteFit Harness. Why We Liked It – What is not to like about this Puppia soft dog harness? It is soft, lightweight, easy to put on and take off, machine washable and adorable looking – perfect for small dogs to run around in! What many dog owners fail to think about is car safety, and this mini dog harness is made to ensure your pup’s safety while going with you on adventures. Simply put the harness on and attach it to the seatbelt with the included seatbelt attachment loop, to make sure your dog stays where he or she is supposed to (reducing driver distraction), but also that he or she is safe in case of an accident or a sudden turn. Dogs are family members, and we owe it to them to keep them as safe as possible at all times. Why We Liked It – There is no reason why a dog shouldn’t be strapped in while riding in a car, since after all – there is a reason to why humans are. This harness can also be used for walking once you reach your destination, which makes it a great choice when looking for small dog halters. When looking for a harness for your small dog, the most important things to think about are; comfort and for the harness to be lightweight, as it could otherwise cause irritation and weigh your fur baby down. You never want to restrict a dog’s movement, so just look for a product made with soft and breathable materials, with a design apt for active dogs. Small dogs move fast, and they move a lot, so to consider them an active dog is of utmost importance. Why do I need a small dog harness? Small dogs need plenty of exercises too, and a small neck is more prone to shock collar-related injuries, which is why it is important to purchase a good and ergonomic harness. Many dog owners don’t realize the risk they are exposing their miniature- or toy dog to by using a regular collar, because while a yank to the dog leash might do little to a large dog – it could provoke serious injury to a smaller one, such as a crushed windpipe. If looking for comfort rather than a high-function hiking harness, you might want to consider one of the softest options such as the Puppia Authentic RiteFit or similar models, since they are so ultra-soft that the dog will barely notice wearing it. 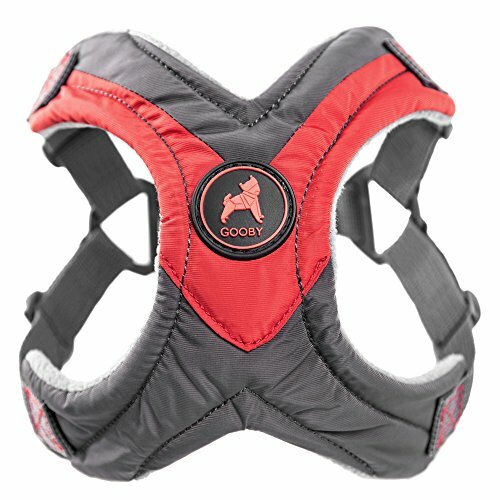 The Gooby Choke Free Comfort is a great option if your dog tends to choke a bit when pulling forward with regular harnesses. 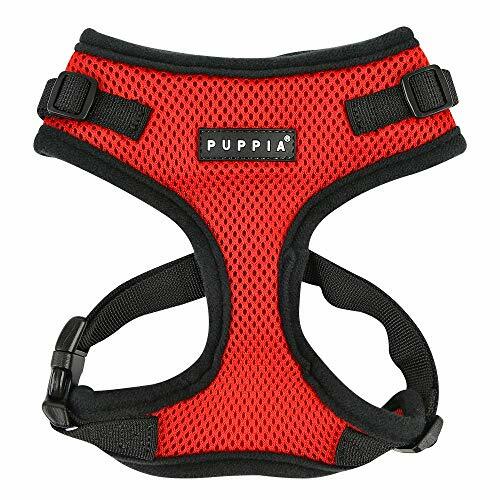 It looks similar to the Puppia Soft Dog Harness, but it has V-shaped neckline to avoid cutting off your dog’s air supply as he or she walks. 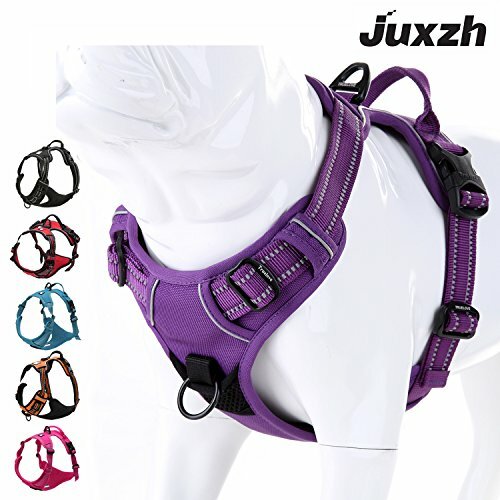 The JUXZH Soft Front is a durable high-quality harness with Nylon webbing and reflective features, which will fit your dog perfectly while also increasing safety when walking at night. 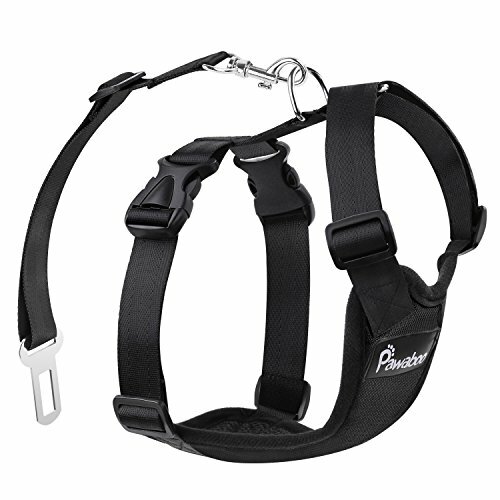 If looking for a no-pull harness, your best bet is to go with a harness with a front clip, such as the PoyPet No Pull, since a front-clip harness forces your dog to slow down a bit. The RUFFWEAR Front Range All-Day Adventure harness has several features that are beneficial for an adventurous hike or a different type of adventure, such as a pocket for an ID tag, a heavy duty handle in case your dog needs to help up on a rock or down a slippery slope, it has two leash attachment hooks and is made from a material that resists both dirt and water. The right harness can open up a lot of doors for you and your dog and give you the opportunity to explore and discover together the way friends should. A harness will also make sure that your small dog won’t end up hurting him- or herself when out dog walking, running or playing, which is something any responsible dog owner should strive for. A dog is like a child; a member of the family, and it is our responsibility as owners to make sure they are taken care of and getting them comfortable dog walking gear surely is the lest we can do to assure that they’re alright. Pick a harness that you like and that you feel okay with; as well as one that your dog can wear without issues and see for yourself how much more fun it gets to take walks. Don’t forget to measure your dog. It is easy to rely on dog breed suggestions and instinct, but it rarely ends up well. Make sure you measure your pooch before ordering a harness, even if you have already measured him or her a couple of months ago, to make sure you get a size that fits. Small dogs get bored too, and boredom can result in destructive behaviors such as barking, scratching, chewing and pacing, so by buying the right harness for your dog, and by taking him or her for regular walks every day, you are also combatting these types of unwanted behaviors. See more tips here.